The IdZ-ES systems is designed for a 24 hour high intensity mission and a secondary 72 hour mission and the ensemble is literally a bottom-up design, beginning from underwear through various layers and sub-systems with everything adapted to the system including integration with the vehicle and Battle Management System (BMS). The key tests for IdZ-ES were six main functional tests mainly which focused on clothing, protection and carrriage systems, with the last identified as the bottleneck. When the initial system was put together, the maximum weight was 72kg which could be more than the bodyweight of some soldiers and operationally unacceptable. A decision was made in the Summer of 2010 to split the system and to provide a 110l backpack required for airborne users and others requiring additional loads. The core of IdZ-ES is the Basic Equipment, equipping every soldier. 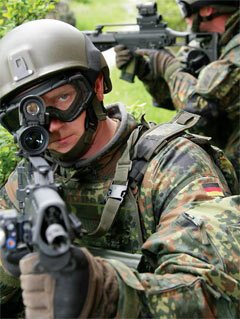 This comprises the complete battledress, load carriage systems, helmet with integrated digital magnetic compass so that the map is always in the right orientation in the soldier’s direct view, independent helmet mounted display, night vision goggle with a built in display and third hand display which is also the main operational unit for the computer. This is linked to data and voice UHF radio IP based and hybrid GPS inertial navigation. The system is powered by two batteries with two sets necessary for a 24 hour mission. When in a vehicle, each soldier plugs into the vehicle’s systems at single point, updating C4I data, recharging batteries and using the vehicle GPS so that they have a constant accurate position location, with a three second delay when they leave the vehicle. There are currently no Combat ID systems available although its planned integration means the system is ready to accept it at a later date. The Commander’s system has an additional VHF radio and additional portable control computer to prepare missions and to also receive data from the higher level BMS. There is however currently not a BMS interfaces for IdZ-ES because the desired option is for a NATO based MIP DEM information-transfer and that is not ready. For the VHF radio, the heavy and bulky legacy SEM radio is being replaced by a new hand held radio; either a Thales PR4G or Harris Falcon III radio with certification by early 2012. This decision is being taken outside the IdZ programme office. Beyond this is mission equipment. This includes a Long Range Rifle and Light Machine Gun. Work on narrowing down weapon accessories is underway from a large variety of devices in service today. On the STA side a recent addition to the suite has been the Jenoptik Bird which will fulfill similar functionalities as the Vectronix Moskito but operating in a different wavelength. Soft ballistic protection on IdZ-ES is Class 1 upgraded to Class 4 with ballistic plates which are offered to soldiers in at least three different sizes to ensure a good fit. Rippert cited significant problems, now solved, in developing the right neck protection which neither interfered with the weapon lock nor vision by interfering with the helmet. Rippert said, “We had to shrink the outer form to a lesser volume because of problems [with vehicle integration]. For that reason we decided to have a soft ballistic vest directly on the body and this limits the body’s ability to evaporate sweat and to stabilise body temperature so we had to implement active ventilation underneath. We realised that in 2004. We had a lot of work to do to develop an effective system and it took us nearly six years.” The resulting front and back ventilation system also works in conjunction with NBC kit. The IdZ-ES helmet is a new design with an all in weight requirement of 1.4kg, fully equipped with electronics including a DMC at the back, with all-moulded fixtures and designed to withstand 640m/s against fragments and defeat 9mm parabellum rounds. One of the key requirements was that all C4I operations in a combat mode without taking hands off any of the weapons used in the system and all have been adapted. Rippert gave the example of how this works on the standard assault rifle, the G36, “We can operate the radio on the PTT and we also have an integrated switch for the laser range finder so you do not have to take your hands off the weapons and operate this device separately. The push to talk button is operated via Bluetooth with back up cabling. Further adaptation of the system’s weapons has been made to ensure integration with the new armour. The IdZ-ES system has been designed for rapid information input; three intuitive button pushes are all that is required activate the laser range finder, lase the target, display it in the situation map and share it within the squad as object mark in the look-through-display. Karl-Heinz Rippert was speaking at Soldier Technology 2011.